I have blogged regularly about our deer population and our resulting approach to landscaping. 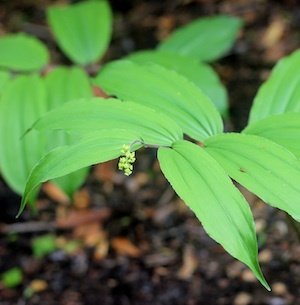 We continue to study the forests, look for interesting plants that the deer don't seem to be eating, and then try transplanting some of them into our natural garden. Last spring David and I decided to do some small batches of different things to see what died, what lasted the season, but most importantly, what bloomed again the following year. This is year two for a group of wild flowers that we were quite successful with. We found two wild Columbine plants on our roadside. Both have returned this year, doubled in size and given off twice as many blossoms. The intricacies of these flowers make them a favorite of mine. How could anything so delicate be so wild? 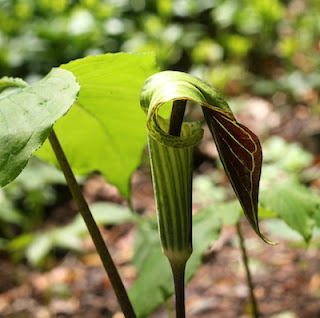 The woods surrounding out home are filled with jack-in-the-pulpits. We weren't sure if they would transplant so only brought in about a dozen. Most have returned and are sprouting jacks right now. We have this planted on the upper side of the path leading down to the stream so you can see Jack without bending over. I like King Solomon's Seal not for the tiny flowers but for the effect a grouping of the plants makes together. It grows in an arching stem with large leaves shooting out to both sides and is effective in groups. About 50% of the plants we transplanted survived. We'll try more. This wild geranium is really in its third year here. This beautiful flower grows along our roadside but generally as singletons. We transplanted a bunch and planted them in a clump. 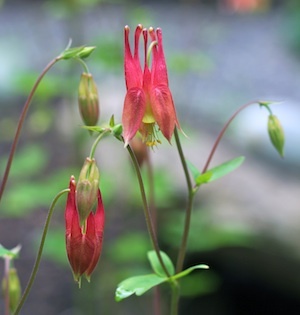 They not only have a wonderful flower in May but the leaf is very attractive after flowering is done. 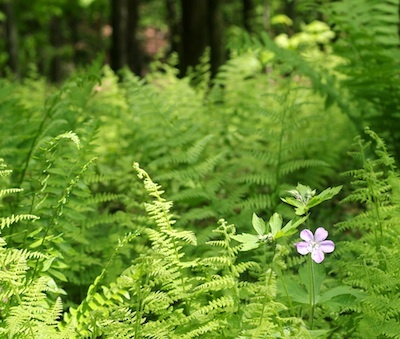 The above plant is a very pretty ground hugging tiny darker leafed plant. We find them sparsely located in our woods. We were successful in planting a small grouping into a darker corner. 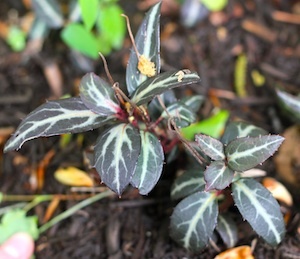 It has a beautiful variegated leaf with red veins. Anyone know its name? 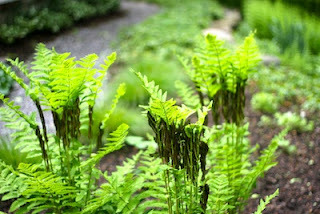 This gardening project started years ago with transplanting ferns. Ferns have done remarkably well both as dramatic accent plants and coverage for larger areas. They come back year after year and require very little maintenance - my type of gardening to be sure! I used the Connecticut Botanical Society website for help in identifying the wild flowers. Additional note on life: It has been gray, wet and rainy for a long stretch here in southern New England. I have been wanting to do this post for several days because the wild flowers are in bloom but the lighting for photography is so gray and flat. Finally, I took the pictures even though the day is again gray. No sooner do I finish this post than the sun comes out! I would have done it earlier had I known it would bring out the sunshine. Off the take more photos. 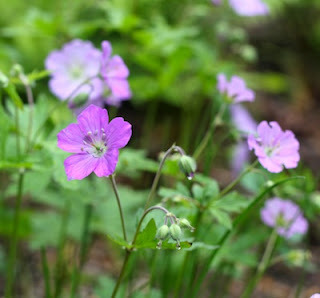 My husband and I love wild geraniums. They're one of the first wildflowers to come up in the spring here in Minnesota. But we let them propogate for so long that now they're killing off some of our other plants. If you don't dig up some of the rhizomes periodically, you'll probably have the same problem. If you can find any, transplant some anemone, with the white flowers. A beautiful plant; leaves are similar to wild geraniums but more striking, and with us, as the geraniums start fading, the anemone is starting to bloom. We have them interspersed in our yard, and the effect is gorgeous. Darlene, Thanks for your advice and comments. How long did it take before the wild geraniums starting taking over? Mine have been growing for three years and although they are healthier, they haven't really spread. I just went to the Connecticut Botanical site and search on anemone. the Canada variety is common in the midwest and an endangered species here in Connecticut. the also refer to a wood anemone. I'll have to keep my eyes open for it. I can't say as I've noticed it.